The electronic health record (EHR) is defined as a repository of information regarding the health of a subject of care, which exists in computer-processable form, stored and transmitted securely, and accessible by multiple authorized users. Its primary purpose is the support of efficient, high-quality integrated health care, independent of the place and time of health care delivery. To achieve these objectives, the semantic interoperability between information systems of different health care providers is a key issue. The EuroMISE Centre is located in the Czech Republic and is based in the Department of Medical Informatics at the Institute of Computer Science, AS CR. Development of the EHR started here in 2000 and was based on experience from existing standards (CEN/TC251 European Standardization of Health Informatics) and several European projects. The proposed system should combine structured data storage with free text and the possibility of dynamic extension and modification of the set of collected attributes without any change of the database structure. The main goal of the research in this field was to suggest common general principles to increase the quality of EHR systems, to simplify data sharing and data migration among various EHR systems and to help overcome the classical free-text-based information stored in a medical record. The suggested solutions were implemented in a pilot application named the MUltimedia Distributed Record (MUDR). 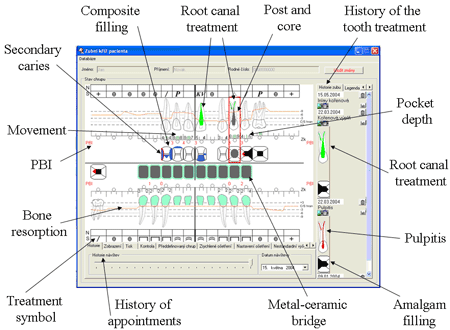 Figure 1: The special interactive user interface for data storage in dental medicine. The MUDR EHR is based on a three-layer architecture: the database layer, the application layer and the user interface layer. Because of the requirement of a dynamically extensible and modifiable set of collected attributes, the classical relational database structure with columns corresponding to the gathered variables was not suitable as a basis for the information storage. Instead, the solution is based on two main structures described by tools of a graph theory. The set of collected attributes and relations among them are stored in a directed graph structure called the knowledge base. The vertices of the graph describe the collected attributes, while the graph edges describe the relations among attributes. The dominant edge of the type inferior defines the main hierarchical tree structure of the knowledge base. Another hierarchical graph structure named data-files is used to store the patient data. Each tree in the graph describes the data of one patient. Each vertex in the tree describes one instance of the medical concept from the knowledge base. The values are physically stored in separate tables according to the physical data type. Knowledge of cardiology and dental medicine was gathered for MUDR EHR, and the special interactive user interface was developed in dental medicine according to requirements of physicians. The knowledge base content for the pilot project implementation in cardiology was prepared as a set of approximately 150 important medical concepts, named the Minimal Data Model for Cardiology patients (MDMC). This model was prepared by consensus of Czech professionals in the field of cardiology as the basic data set necessary for an examination of a cardiology patient. Since uniqueness of term definitions and their precise denomination are necessary in order to prepare the EHR, we found that our classification of medical terms was not optimal. Insufficient standardization in medical terminology represents one of the prevailing problems in processing of any kind of medical-related data. Various classification systems, nomenclatures, thesauri and ontologies have been developed to solve this problem, but the process is complicated by the existence of more than one hundred incompatible systems. The most extensive current project that supports conversions between major international classification systems and records relations among terms in heterogeneous sources is the Unified Medical Language System (UMLS). During development of the MUDR EHR and MDMC, which was supported by the 1ET200300413 project of the AS CR, the UMLS Knowledge Source Server was used to evaluate the applicability of international nomenclatures in the Czech medical terminology. During the analysis we found that approximately 85% of MDMC concepts are included in at least one classification system. More than 50% are included in SNOMED Clinical Terms. The concepts may be divided into five classes. Trouble-free concepts can be mapped directly. Partially problematic concepts have several mapping possibilities to various synonyms, which differ slightly in their meanings and usually in their classification codes. Concepts may also be too general or too narrow, such that classification systems contain only concepts of a narrower or wider meaning. There are also concepts that cannot be mapped to any of the classification systems. Close cooperation with specialists is therefore required. It is often necessary to choose the right standardized synonym to substitute for a certain technical term. Sometimes it may be better to describe a non-coded term by several coding terms and include their semantic relations. In some cases it may be possible to add a certain concept into an upcoming revision of a certain coding system. However, sometimes the restricted interoperability is inevitable. The structured electronic health documentation is a necessary requirement for modern information systems in health care. It provides intelligent decision-support tools and information-processing techniques and results in improved reliability, accuracy and effectiveness of health care. Use of international standards and nomenclatures is the first and essential step towards interoperability of heterogeneous systems of EHRs.